If you’re anything like I was a few months ago, you dread that time of the week or day, depending on how much traffic you have coming through your home, when you need to give your floors some TLC. The process was always tiresome. I would run hot water in my sink and fill my mop bucket with it. Since there was nothing to keep my water from getting cold, especially in the winter, I would have to rush and clean as many rooms as I could before I had to dump the water and start again. I knew there had to be a more efficient way to clean my floors and still have enough time to spend the rest of the day with my family. I had lost hope until I found out about steam mops. I spent hours researching and asking friends and family if they had experience. Steam mops produce a consistent stream of steam to clean your floors. 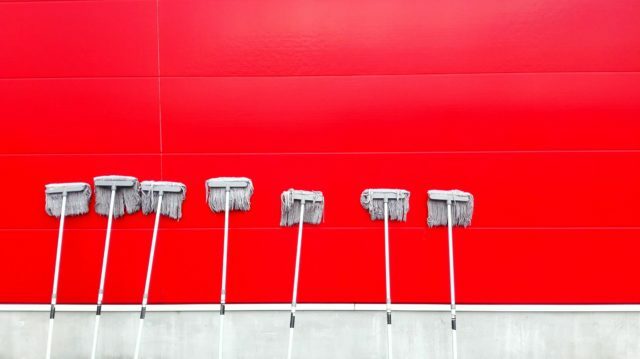 Most steam mops are also efficient at removing 99.9% of germs. The best part? It gives you back a huge portion of your day that a traditional mop takes away. However, there are so many options to choose from that it’s easy to become overwhelmed and just give up. Luckily I love research and comparisons. I’ve organized a list of the best steam mops available today so you can have a clean floor in less time. Known as the #1 manufacturer of floor care products in North America, Bissell knows exactly what it takes to help you keep your floors looking brand new! So, it’s no surprise that the Bissell PowerFresh 19404 is the best steam mop that does an incredible job, helps keep your floor sanitized, smelling nice, and doesn’t break the bank. Plus, I personally love how efficient it is. Keep reading to learn why this is the best steam mop. The Bissell PowerFresh is an easy-to-use steam mop that can cut through old spills and grime with just a few passes of its microfiber mop pad. It takes 30 seconds for the water to heat up to 180 degrees. Setting it up also isn’t a problem. Just plug it in and the ready light will start beeping. Once it stops, you can press the steam level button, and steam will continuously flow out of it for 17 minutes before you have to add more water. Also, this unit has a 23-foot long cord that allows you to clean a generous amount of space before it reaches its limit and you have to unplug it. Depending on how big your home is, that might be the living room, kitchen, and the hallway. The Bissell’s mop head size is 13 inches wide. When it comes to how much time you’ll spend cleaning, it’s important to know how much space your mop can cover at once. If the mop head isn’t wide enough, you’ll spend a lot of time in the same spot. However, its mop head is the right size to clean a good portion of my floor without me having to spend too much time in one area. This best steam mop choice also does an incredible job cleaning high traffic areas and dried-on stains. My floors are always muddy because there’s more dirt than cement where I live. I use my vacuum first then clean up any mud that might have dried up. With two passes of the Bissell PowerFresh, my floors are spotless. When I first purchased my steam mop, I put it to the test with a thick dried-on stain of ice cream. I had tried my traditional mop and bucket with extremely hot water on it to no avail. I was convinced that I was going to need to remove my tile because the stain wasn’t coming up. However, the Bissell powered through that stain in a few seconds. 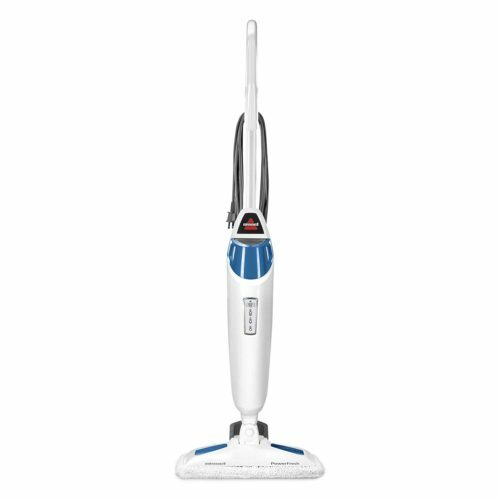 The Bissell PowerFresh is a self-standing, white and blue steam mop that weighs 6.4 lbs. It comes with a washable everyday microfiber pad and a deep scrubber pad. It’s easy to maneuver under furniture and in hard to reach places because of its slim design. Its head can swivel up to 90 degrees, which is remarkably convenient when you’re trying to clean corners from different angles. Also, since the mop head is rectangular, you can easily glide it against the wall to reach those stains that are often easy to miss. Once the ready light stops blinking, you can adjust the steam level to low, medium, or high. If you’re just trying to give your floor a gentle clean, you can use the low setting. If you need it to remove deeper stains, you can use the high setting. One of the most convenient features of this unit is its removable water tank that holds a maximum of 15-ounces. When it’s time to refill the water, you don’t have to worry about wasting it on the floor. Just remove the water tank and pour distilled water in it over the sink. It also comes with two scent disks that you insert inside the mop pad. Or you can buy an additional solution, so you don’t have to give up the smell of a freshly mopped floor for sanitation. If you need a little extra force to remove some really stubborn stains, then you can use the Easy Scrubber. I love this feature as it’s really helped with some of the stains that I didn’t think I’d fully get rid of. This feature adds to my confidence that this is the best steam mop. The Bissell PowerFresh comes with a one-year limited warranty. Harder to push when using the scrubber pad. When you’re using the microfiber scrubber pad, it’s a little hard to push compared to the everyday softer pad. The first thing you need to make sure is that the mop pad is wet enough for you to maneuver it easily. If not, it will feel a lot harder to push. However, if it’s wet enough, then make sure you’re not applying too much force on the handle. The mop will glide itself without extra force. It needs to reheat when you unplug then replug it. After you’ve reached the cord’s limit and need to replug it so you can clean other rooms, it takes a few seconds to heat up. While this can be inconvenient at times, it’s a safety precaution. Would you really want a steam mop that stays hot, even after unplugging it? Overall, this best steam mop works great for my home and my needs. As I mentioned, muddy floors are quite common in some areas of my home. I also have a small child who makes it impossible to keep floors clean. However, because I have a small child, I need to keep my floors as clean as possible, in a fast and efficient way (I take advantage during his naptime). The Bissell meets my needs, and then some, making this my choice for the best steam mop. Shark was designed to fit the lifestyles of busy people. Their steam mop motto is, “There’s clean. And then there’s Shark® steam clean.” We even voted a Shark vacuum as the best vacuum cleaner for your home. Their steam mop doesn’t disappoint. From a two-sided Steam Pocket mop pad to a carpet glider, the Shark Professional Steam Pocket S3601D came in a close second for the absolute best steam mop. The Shark Professional is a robust steam mop that vigorously attacks any spot on your floor. Whether it’s freshly spilled orange juice or dried-on spaghetti sauce, it’ll get the job done with its washable microfiber pads. It takes 30 seconds for the mop to heat up to its maximum steam level. When you’re ready to use it, it’s similar to the Bissell PowerFresh. You just plug it in, press the steam control button until you reach your desired steam setting, and wait for it to heat up. Once running, you can expect at least 20 minutes of continuous steam. The unit has a 22- foot long cord, so you won’t be able to cover as much ground with the Shark Professional like you would the Bissell PowerFresh. However, that doesn’t mean you won’t get a good cleaning from it. The Shark’s mop head is 12 inches wide. But the most noteworthy aspect of this mop is its two-sided Steam Pockets. When one side is dirty, you can flip it around and use the other side to clean your home. This feature makes cleaning an area so much more efficient. You don’t have to worry about pushing dirt around because your mop pad is dirty. Instead, you’ll have the comfort of knowing that your floors are getting sanitized to the highest degree possible for the Shark. Not only does it give you more mop pad to clean with, but it also comes with two Quick-Release mop heads: rectangular and triangular. A rectangular head can help you reach hard places and cover more areas than a triangular head. But the triangular head can help you get between the toilets a lot easier. On top of this, it also has a water tank capacity of 16 ounces. The Shark Professional is a gray and white, 4.85 lb steam mop. Since it’s so lightweight and comes with two types of mop heads, you can easily maneuver it under and around appliances and furniture. It also has three levels of Intelligent Steam Control: dust, mop, and scrub. Each steam setting has its own purpose and type of floors it’s ideal for. The dust setting is ideal for floors that can become disfigured from excessive steam usages such as hardwood, laminate, bamboo, and marble. The mop setting is also ideal for hardwood and marble, in addition to tile and stone. And although you can use the scrub setting on hardwood floors, it’s not recommended because it’s more suitable for floors that can tolerate high levels of heat. The Shark Professional comes with a carpet glider so you can give your carper or rugs a light steam cleaning. The Shark Professional comes with a one-year limited warranty. It doesn’t stand on its own. While this is more of a convenient feature, it makes a difference if your mop can stand on its own. If you prefer to not lean your mop against something else, then you have the option to hang it on your wall. The water tank isn’t removable. It does come with a filling flask so you don’t have to waste water on your floor, but it’s a little more complicated to empty the water tank. The Shark Professional is still a high-quality tool, but it just doesn’t cut it to make the best steam mop spot. I find having a removable water tank makes the process so much smoother and easier. 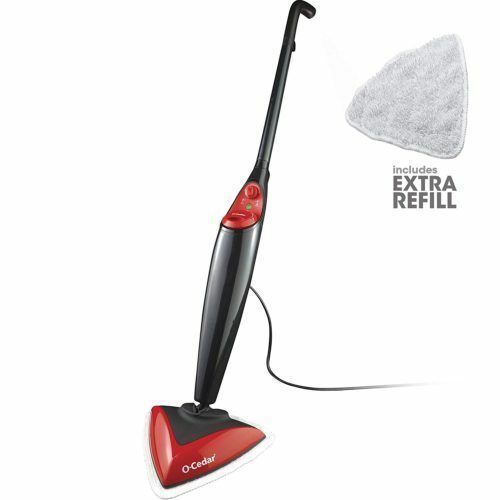 O-Cedar’s signature tagline is “O-Cedar Makes Your Life Easier!®” TheBissell PowerFresh is sure to be a big help to your mopping routine (and bank account). The O-Cedar is a simple steam mop that is guaranteed to give your floor a shine with its washable microfiber pad. Unlike the Bissell PowerFresh and Shark Professional which take 30 seconds to heat up, the O-Cedar Microfiber Steam Mop takes 20 seconds. Another feature that makes it unique from the others is that it comes with an On/Off button on the back of the unit. So you don’t have to unplug it for it to turn off. After you’ve powered it and gave it time to heat up to your desired steam level, you can expect continuous steam for approximately 15 minutes. Then you’ll need to refill the water tank which holds 13.5 ounces at once. It also has a cord length of 19 feet. So, while it’s not as long as the others, it still does an incredible job. Its mop head is 12 inches wide. Since it has a triangular mop head, it attacks dirt in corners and gives you the ability to precisely clean any grime that accumulated there. The O-Cedar is a self-standing, black and red, 5 lb steam mop. It’s lightweight and slim so maneuvering it under and around objects is relatively easy. You can control the steam anywhere from minimum to maximum. The other units have actual temperature levels. However, the O-Cedar uses a dial which you can use to adjust the steam to your needs. Similar to the Shark Professional, the O-Cedar comes with a carpet glider for carpet cleaning. To use this feature to its maximum potential, make sure to vacuum the carpet and remove any dirt first. The O-Cedar comes with a one-year limited warranty. Only comes with a triangular mop head. There’s no denying that triangular mop heads are useful for cleaning corners and places that rectangular mop heads can’t reach. But, they take longer to clean large spaces. You can mop sideways so that the tip of the mop is behind the straight side. This will allow you to reach as much space as a rectangular mop. Mop pads aren’t made for scrubbing. Its mop pads are made out of soft microfiber material. Although microfiber material does a good job of removing stains, it’s not what I use for deep cleaning. If you plan on using this for weekly deep cleaning, then see if you can find a triangular mop pad that’s for scrubbing purposes and fits this steam mop. I can’t tell you what might fit your personal needs. But I know that each steam mop on this list is designed to make mopping a less troublesome experience. 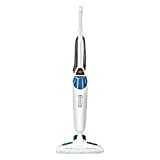 If you’re looking for the best steam mop that has the power to clean some extremely stubborn stains while also giving your floor a nice smell, then you need the Bissell. But if you have a big home and prefer the convenience of covering twice the amount of space as the Bissell before having to change mop heads, then the Shark Professional is for you. Or if you’re on a budget and just need a steam mop that’ll clean your floors, then you should consider the O-Cedar Microfiber. Regardless of what you choose, one of the above best steam mop options is sure to be a winner. Q: Is it really worth it to invest in a steam mop? The short answer is that yes it is. The traditional mop and bucket used to work when homeowners didn’t have extensive careers or other responsibilities. Now, however, it’s not very often that someone can dedicate a full day each week to cleaning their floors. That’s why I recommended a steam mop for anyone who’s always busy but doesn’t want to hire someone or let too much time pass before they clean their floors. Most steam mops take 30 seconds for the water to heat up. 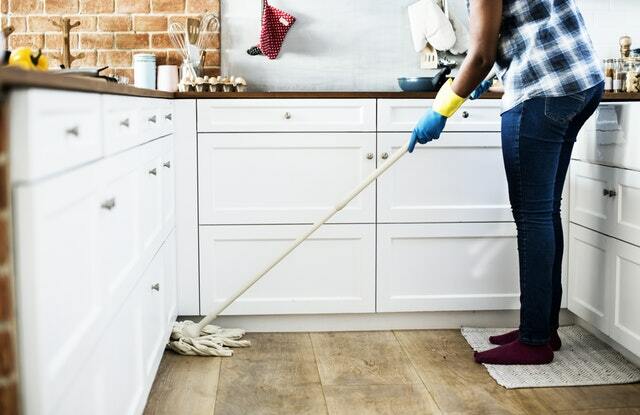 Then depending on how large the water reservoir is, you can use the mop for 20 minutes before you have to add more water, which isn’t a time-consuming task. Since most models dispense steam of 212 degrees F, it sanitizes your floor without the harsh, harmful chemicals that are necessary to use with a traditional mop. You only need distilled water. So, if you have pets or children, you can keep their environment chemical-free without sacrificing cleanliness. Q: Is a steam mop safe to use on my sealed hardwood and laminate floors? Hardwood and laminate floor manufacturers don’t recommend it and here’s why. Hardwood floors by definition are wood. The wood itself is very absorbent. When water comes in contact with hardwood floors, it can potentially cause them to warp and buckle. So, when you add heat into the equation, the likelihood of the hardwood becoming disfigured overtime increases. Laminate floors are multi-layer flooring that resembles hardwood or stone on the top layer because of a photographic image. When installing laminate flooring, you don’t use glue or adhesives since it’s a floating floor and clicks together. There are a few different ways that steam mops can damage this type of flooring. The first one is that over time, the steam can wear away at the top layer of the photographic image. This can lead to dull floors. The second way is if water gets through the seams and causes warping because of excessive water. Also, both hardwood and laminate floor manufacturers say that you void your warranty if you use steam mops on them. However, if you plan on changing your floors sometime in the future anyway and you’re okay with the damage that a steam mop may cause, then you should use a steam mop on the lowest temperature setting and is designed to quickly dry up water. Q: Can I use a steam mop on my unsealed floors? If not, how can I tell if they’re sealed? You shouldn’t ever use a steam mop on an unsealed floor because the risk of water damage occurring and disfiguring your floors dramatically increases. To see if your hardwood or laminate floors are sealed, drop a small amount of water on the floor. If the water just sits there then you know that your floor is sealed. However, if the water starts to absorb into the flooring and makes a spot, then you know that it’s not sealed. Test this method in at least two areas around your home to make sure that the sealant in intact throughout. An additional test you can perform on laminate flooring is to grab a knife and in a corner, scrape a small amount off the floor. The blade will have a clear substance on it if the floor is sealed. This entry was posted in In Depth Product Reviews and tagged steam mop. Bookmark the permalink.